Today was my first pottery class. One of our regional artists, Tammy Troyer, was giving lessons so I jumped at the chance to learn. I'd met Tammy at a local arts and crafts fair last month and had the pleasure of watching her at the wheel. When she said she'd be offering classes soon, I jumped at the opportunity to learn. This is something I've always wanted to do and since I've had it on my bucket list for some time, I figured why wait any longer. I met Tammy at our local Arts Center early this morning. She asked if I was sure I didn't mind getting dirty and I assured her I didn't. She said she was glad and she had some aprons hanging on the hook in the corner. "Why don't you get one while I change into my work clothes." I did as instructed and picked out a nice, heavy denim apron. I figured that would be the best choice for keeping clay off of my clothes. After Tammy had changed, she pulled out a large box with a huge square of clay in it. "This will be your clay," she said. It was a twenty-pound block and was wrapped in plastic to keep it moist. She took a wire and sliced a chunk from the block. Then she cut the chunk into four equal parts. "The first thing we need to do is to round off the corners," she said. Then she began to show me how to pound the clay to work off the corners. She did two and I did two. It was fun but it was also hard work. The clay was dense and my arms were weak. When the clay had been worked, Tammy said we were ready to start. She took me over to the pottery wheel and sat down in front of it. She wanted me to just watch for a few minutes. She took the hunk of clay and slammed it down into the center of the wheel as she explained how important it was to make sure the clay was in the middle. Next, she began pressing the base of the clay tightly to the wheel explaining that it would help keep it in place and prevent it from sliding away. Next, she took a small sponge and soaked it in water. She drizzled the water over the dome of clay and turned on the electric pottery wheel. As the wheel began to turn faster, Tammy straddled the pottery wheel, leaned forward, and placed both hands around the clay in a cupping manner. 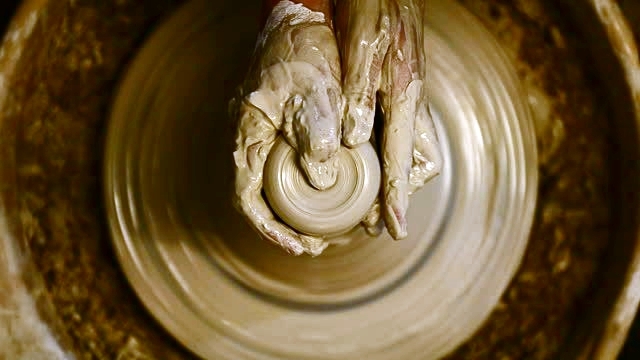 She told me she was going to start to press in and as she did, the centrifugal force would help round out the clay. I watched as she periodically added water and continued to press in with her hands. The next step was coning. By moving her hands together and pressing inward, the clay began to rise up into a cone shape. Next, she'd press it down. Over and over again, she'd repeat these steps until the clay was perfectly centered. After centering the clay, she dug her thumb deep into the center of the clay forming a well. Then she inserted the other thumb and began to spread the clay out. I watched as the hole grew larger and larger. When she got the hole as large as she wanted it, she began to lift up on the sides by adding pressure to the inside and outside of the clay. I was amazed as I saw the project form and then, Tammy pressed a little too hard and the clay collapsed. She laughed and said, "See that's what can happen sometimes, but don't worry, you can always start over." My first pieces of pottery! I was surprised when my instructor got up from her chair and motioned for me to sit down. Sitting in front of me, she asked if I remembered any of the things she'd taught me and said if I did, I could begin. I took my clay and slammed it down into the center of the wheel. I needed to make sure my clay was centered otherwise my piece would wobble and become distorted. I worked hard with that clay and found myself struggling to cone and press down the clay to get it completely centered, but as I continued to work, I did it! My arms were weak because of the lymphedema but I leaned my elbows on my knees and gained more momentum. I couldn't help thinking about Scripture as I worked today. Isaiah 64:8 says, "Yet you, LORD, are our Father. We are the clay, you are the potter; we are all the work of your hand." As I molded and shaped the clay into my desired project, I thought about all the ways God's worked to make me into the person He wants me to be. 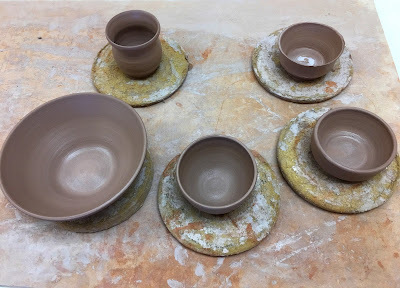 Although clay is very pliable while wet, it's resistant when dry. I'm sure I haven't always been easily moldable and I know there have been times when I've been very resistant. But instead of scrapping me and starting over, God's worked with my imperfections. He's taken time to smooth out the rough spots and make me useful. Just knowing He's fashioned me into the exact work He pictured amazes me. Some of the work I started today will be Christmas presents. Next week, I'll be attaching handles to my mugs and getting pieces ready for glazing and firing. It will take several weeks to complete finished pieces but I'm sure it will be well worth it. When I hold those finished pieces in my hands, I know I'll take pride in my work. I will have made a functional, useful object and I will have had fun doing it. I wonder if God had fun molding and making each of us? I'm sure He probably did. It was a fun day and I'm so glad I was brave enough to take the class. Last year, I wouldn't have been ready to go out into public and try something new.